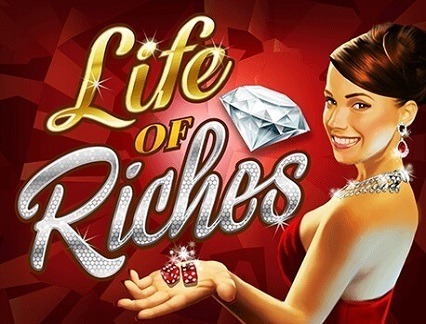 Life of Riches - Enjoy Free Spins with Double Multipliers! Game Information: Life is good with Life of Riches, the exciting online pokie from Microgaming that is inspired by the finer things in life. If you find the life of the rich and the famous appealing, then this is the game for you. Life of Riches is a five reel, 30 payline pokie machine with a highest line bet multiplier of 4 000x. The high volatility of this game means you will probably wait a while before seeing any big wins, but there are plenty of special features available to help boost your wins. These include a wild with x2 wins, as well as free spins with x2 wins and x4 wild wins. 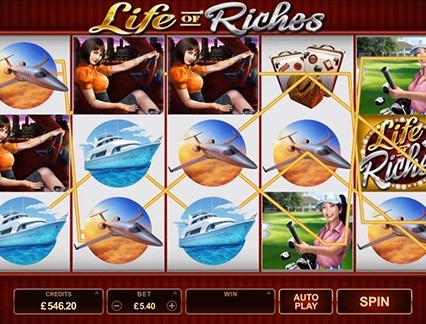 Life of Riches is a five reel pokie with three rows and thirty paylines and a luxury theme that will appeal to those looking for the finer things in life. The main symbols all represent this theme in the most appropriate way, and you will find anything from private jets to fast cards, a golf club, cocktails, a yacht, some luggage, sunglasses, a passport and more. Wild Symbol – The Life of Riches logo act as the wild symbol and multiplies any wins by 2x. The wild symbol replaces all other symbols on the reels except the scatter, which appears stacked on the reels. Free Spins – The free spin feature is triggered when you land three or more scatter symbols on the reel and receive 10 free spins. All wins earned during this round will be multiplied by 2x. If a wild is involved, wins are multiplied by 4x. Additionally, the wild symbol is stacked during free spins. This feature will be retriggered when you land three more scatters. The Life of Riches is a striking game that features excellent graphics and sound effects that will appeal to players of all levels and interests. The chances of winning big with The Life of Riches are good as long as luck is on your side and you have a bit of patience. That is because, despite 30 paylines, the game has a high volatility, which means players will have to wait a while before landing any winning combination. The advantage to playing a high variance pokie is that the value of the prizes are usually higher, with the potential to win a jackpot prize with 4 000 x the value of the line bet when you see five matching wild symbol on one of the 30 paylines. Besides the free spins feature, there is not much additional features to attract high rollers. That being said, the wild and free spins can be quite lucrative, although the game’s betting range can be a bit underwhelming, limiting players to a maximum bet of just 15 credits. This means that more seasoned players will probably not be too impressed while newbies will enjoy the low limits.